. Your cart will total 455 points that will be converted into a voucher of $455 towards your next purchase! Must be logged in to collect points. 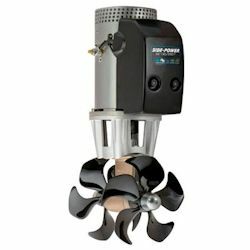 The Thruster SE130 is an excellent choice for yachts from 42-62′ that desire a larger (10″) tunnel for improved thrust, without the cost of counter-rotating props. The SE130’s twin props generate up to 286 lb of thrust to easily maneuver large motor yachts in strong winds and heavy currents. Side-Power’s wide range of control panels and remotes allow you to customize your SE130 installation to fit each application to the owner’s personal specfications.